The New Zealand ski season started slowly. A week before The Luxury Travel Bible's visit there was hardly any snow. Then the flakes started to fall and they've hardly stopped since. So August is a great time to head to NZ for some of the best snow in the Southern Hemisphere. Another good reason to go now is the 100% Pure New Zealand Winter Games, an elite winter sports competition combined with a range of festival activities taking place all around the Southern Alps from 13 to 28 August . New hotels in Queenstown are also a drawcard. 'Where attitude meets altitude' is what they say about The Remarkables and it's true. There are shades of the European Alps here with 220 skiable hectares with narrow chutes, rock drops and off-piste powder for the brave, and wide sunny bowls accessed by three quad chairs for the rest of us. New this Season: Extensive trail work means more terrain and better gradients for novice and intermediate skiers and riders. 12 new snow guns have created consistent snow coverage on novice and intermediate trails. There has also been an upgrade of rental equipment and best of all padded seating fitted to all chair lifts for a more comfortable ride to the top. Coolest Moment: Adrenalin junkies like the Lake Alta area with its off-piste steeps and shoots. Favourite Fuel Stop: If weather permits sit outside on the café deck and watch the antics of the NZ ski slopes most curious bird, the grey-feathered kea birds that are prone to sit on the top of the 4WDs down in the carpark and chew the plastic off ski racks. Live music helps the cafe atmosphere. Luxury loves: The Remarkables' 4x4 coaches and transport system which mean you can leave the car at home and travel the 45 minutes from your hotel in Queenstown (and up the unsealed road mountain road) stress free. We also like the new re-usable My Pass card that stores all your ski information and lift passes (lift gates scan the pass automatically) and clocks up your terrain miles too. The pass can be used at Coronet Peak and Mount Hutt near Christchurch too. These may not be the most expansive peaks around, but at only short 25-minute (18km) drive from Queenstown, they make up for this with ease of access. So on day one, you're straight off the plane at Queenstown airport and straight up on the slopes before you can say 'slalom'. New this Season: A new novice trail from the top of the Meadows Chairlift creating more terrain for novice skiers and boarders. A dedicated Kids Fun Zone comes complete with flags, games and space. A new 102-metre magic carpet lift makes it easy to reach the learner area from the mountain base. New snow guns for lower trails including the new novice trail. There has also been an upgrade of rental equipment. Coolest Moment: Night Skiing and First Tracks mean both ends of the day offer magic moments on snow. Favourite Fuel Stop: The European style Heidi's Hut at Rocky Gully for gourmet pizzas, pasta, seriously good coffee, and mulled wine at the bar. Luxury loves: This much-loved mountain had a serious facelift three years ago and now has a very slick multimillion-dollar building at the base area with gourmet cafes, and a huge sun terrace for those who are more interested in their ski tans than their turns. The Meadows double chairlift was replaced for the 2010 season by a high-speed quad, improving the learning experience for beginners and novices. We also like the new re-usable My Pass card that stores all your ski information and lift passes (lift gates scan the pass automatically) and clocks up your terrain miles too. The card can also be used at The Remarkables and Mount Hutt near Christchurch too. Serious Cardrona fans tend to stay in nearby Wanaka but it is worth the 58 kilometre drive from Queenstown too because Cardrona has great natural snow due to its higher elevation and the fact it mainly faces south. Its runs are wide and forgiving. It also gets a huge gold star for having the best kids club in the Southern Hemisphere. New this Season: The learner' slopes have been redeveloped making them larger and even more accessible thanks to a new magic carpet lift. A fourth quad chairlift opened this season which has expanded resort boundaries and the number of intermediate and advanced runs on offer, increasing the ski area to 345 hectares and vertical rise to 700m. This will mean Cardrona has more chairlifts than any other resort in the South Island. World Champion Halfpipe skier Jossi Wells this week (August 2) opened Cardrona's new dedicated mechanised ski lift for its Olympic and International Halfpipes, so freestylers haven't been forgotten. Coolest Moment: Has to be stopping for a photo-op on the Skyline run with a panoramic backdrop of the snowy peaks and the emerald green lake below: stunning. Favourite Fuel Stop: Love that noodle bar! Gourmet noodles with views down to the beginners' area for anyone who wants to spy on the kids. Great hot chocolate too, served with New Zealand's favourite marshmallow chocolate fish. Luxury loves: Getting to the top quickly courtesy of a new high-speed detachable quad chairlift at Captain's Basin. The new Captain's Express chairlift is two and a half times quicker than the old quad with the journey now only taking three and a half minutes versus nine minutes in the past. Treble Cone near Wanaka used to be only a serious-skiers hangout; light on facilities, and heavy on serious slopes. TC, as it is affectionately called by aficionados, still attracts rugged outdoor-types but these days a substantial upgrading of facilities means it's a great mountain for skiers who love cappuccino-sipping as much a chute-skiing. 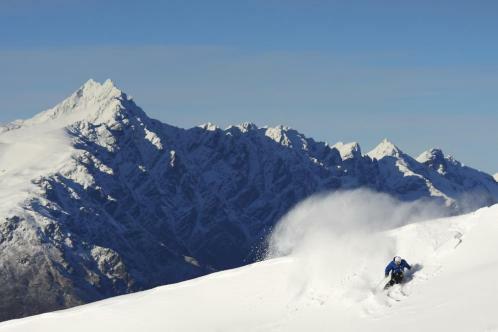 If you're happy to go off-piste TC offers the largest skiable terrain in the south Island. New this Season: New technology and online booking systems that will allow you to load up your pass via the treblecone.com website and go straight to the lifts. Glenorchy Air is launching 15 minute scenic flights from Queenstown to the base of Treble Cone. Flights depart Queenstown at 8:15 in the morning and return around 4pm in the afternoon - passengers will be dropped off at the base of Treble Cone. Coolest Moment: TC has invested heavily to create new runs and widen existing ones over the last four years, transforming the mountain into a much slicker place to ski. The widening of the south Ridge in the saddle basin means more skiers will get to enjoy the beautiful basin. Favourite Fuel Stop: The Treble Cone Bar & Café offers the best mountain food around. None of your 'chips with everything' approach here. There's great sushi, salads and very gourmet burgers. Sour dough bread and homemade muffins come fresh from the oven daily. There is decent coffee too. Luxury loves: The winding roads up to the NZ slopes are notorious, so in a spectacular first for NZ the resort is planning a gondola will transport skiers from the valley floor to the ski field base. Mind you, they've been planning it for a while so don't hold your breath..
Snowboarders and freestyle skiers will do anything to get up high to this fun terrain park, which is why they are lining the roads to thumb a lift to the top. However everyone will enjoy a visit because there is so much more here than just rails and jumps. On a beautiful sunny day with the bluest sky of our trip the park was voted Number One (with big capital letters) by the smallest luxe traveller in our party. Kids will simply love it here. This is what TLTB would call a 'Boutique' ski resort. Small but special. New This Season: Snow Park is expanding fast, there are now ski and board lessons available in a non-threatening gentle-slopped environment; great for kids and beginners and there is tubing fun for all the family. For something more challenging you can Cat-ski in the Roaring Meg back country. Snow Park is also linked to Snow Farm with its kilometres of cross country trails. Coolest moment: Night skiing and boarding under the flood lights. Favourite Fuel Stop: The Woolshed Restaurant & bar has a new menu. When it's cold outside two fireplaces keep everyone warm inside but we especially like the sundeck and the outdoor fireplace, perfect for marshmallow toasting. Mums' of freestyle freaks are often seen sitting all day working on laptops, occasionally glancing up at the awesome antics of their offspring on the slopes. When there is night skiing the restaurant is also open for dinner. Luxury loves: the warm, friendly atmosphere and the on-slope accommodation (some of the only on- slope available in NZ) where a mere $NZ680 a night will get you whole four-bed apartment right on the snow.